Noun. Plural pronounced the same. Early 20th century. 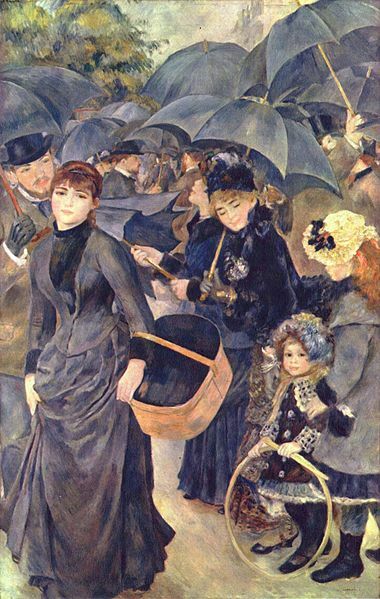 When I was about eight years old, I went and viewed The Umbrellas by Renoir at the National Gallery in London. Instantly, I fell in love with the woman on the left. While it's true that it would probably be more accurately described as a béguin, an infatuation can be extremely powerful and my first meeting with this woman is a very poignant memory. Even now, my béguin is such that she will instantly arrest my attention if I ever see the picture (as will the nagging jealousy I feel toward the man behind her who is perhaps thinking of making a move). Do we use the French pronunciation in English, too? Yes, I think so Evi, especially as it's not a very familiar word so no equivalent English pronunciation has become established. You're right, Kara. It's painted in a photographic style, so it's quite possible they are looking at *you*, the person taking the shot. Also, the main subject of the painting (that lovely, lovely woman on the left) is not at the centre, and various people in the painting are partially blocked, etc, just like a unposed photo.